Trivikram Srinivas is one director in Telugu cinema who is always in demand despite not so high success rate of his films. The reason for this is that the director has always been successful in re-inventing the star whenever he has worked with them. 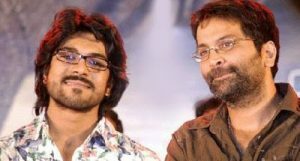 According to latest information Megapower Ram Charan has accepted Trivikram Srinivas movie and This Crazy Combo Will Produced by DVV Danayya may be the producer of this film. Yevadu & Zanjeer‘ are already in the pipeline. With two more scripts ready from Koratala Siva and Trivikram, Ram Charan seems to busy till 2014. Charan revealed that after completing his project under Koratala Siva of ‘Mirchi’ fame, his new project with Trivikram will take off.